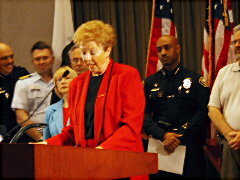 The City of LB has significantly ramped up security. The actions involve a number of City Hall departments and the Port in a coordinated effort with regional, state and federal agencies including the U.S. Coast Guard. Every LB resident has a responsibility to be prepared -- earthquake style -- to sustain himself/herself and their familymembers in an emergency for at least three days. 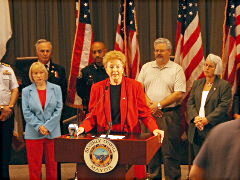 LB's top officials assembled in the City Council chamber: LB Mayor Beverly O'Neill; Vice Mayor Frank Colonna; Councilmembers Bonnie Lowenthal, Jackie Kell and Val Lerch; Acting City Manager Gerald Miller; LB Police Chief Anthony Batts; LB Fire Chief Terry Harbour; U.S. Coast Guard Commanding Officer for LA/LB Capt. 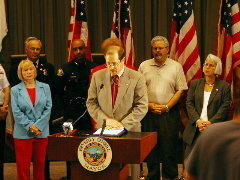 John Holmes; Port of LB Executive Dir. 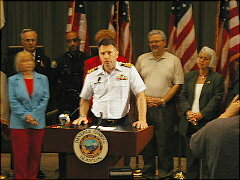 Richard Steinke; Port of LB Security Chief (and retired LB Police Chief) Bill Ellis; Dir. 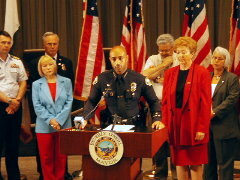 of Health and Human Services Ron Arias; LB Airport Mgr. Chris Kunze, and LB Emergency Services Coordinator Casey Chel. Although we're going through trying times, it's extremely important to let the citizens of Long Beach know this is basically business as usual. The city is running, it is OK. I'd like to share with you some of things that we have done to prepare. This isn't something that comes as an event that hasn't been planned for. We have table-topped exercises like this several times. Our city is in capable hands. We have made sure that all our on-duty personnel are now in uniform. We have cancelled all of our training to ensure that officers are on the street. We have gone to 24 hours a day, 7 day a week coverage in our Port. We have some of our civic center locations thoroughly covered with officers. We're providing helicopter coverage on a seven day a week basis to make sure that we have airplanes in the air. We've activated our mobile field force platoon, which means that we have extra officers who are out on the street to respond to any potential issues that take place. We've conducted surveys of all our critical facilities in our city and we're making regular contact. For instance, with the Jewish community in their temples, and at Mosques, to ensure that everything is going well. We've set up our department operational command center, which is in touch with Coast Guard and our Port authorities and working with LAPD and L.A. County Sheriffs, and we'll continue to do that. My greatest concern is as we invoke our first amendment rights, and our ability to protest -- and we will make sure that is taking place in our city in an orderly way -- I ask that you assist us as you do your protests, and we maintain your first amendment rights. Some of the things that we're asking the citizens to do is to pay attention to your surroundings right now. We're asking you to pay attention to suspicious people, to suspicious activities, trucks parked in places that may raise attention. Pay attention to people who may stand out, like taking pictures of bridges, world trade centers, and things of that nature. And be vigilant. I think in my closing what I'd like to say is that we'll be OK. 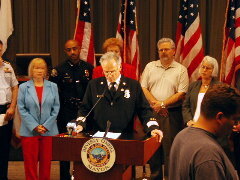 The Long Beach Fire Department is prepared to respond to any incident threatening persons, facilities or the waterways in the City of Long Beach. 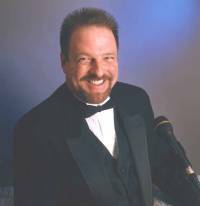 There are three levels of command and control that will be involved in this effort. Localized alert: A localized alert is our everyday incidents that occur in the city, and they will be coordinated and controlled at the Battalion Chief level, a regular incident that happens on any given day. Citywide alert: The EOC serves as our citywide coordinating center. The city's EOC currently is located the Fire Dept. training center and it is in the standby mode and can be activated at a moment's notice. 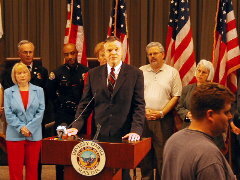 All of the city resources that need to be there, the departments that represent the emergency response personnel and teams to coordinate an effort in the city, which include Police, Fire, Health, Public Works, Finance, Building, Port and Water, are on a standby mode to activate this center at a moment's notice. Mutual Aid: The third level is mutual aid. 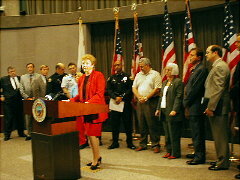 Long Beach may be requested by region one to assist another community with emergency response personnel, police or fire. Any form of assistance outside [unclear] and will be approved by the City Manager and it will be based on the threat level and possible impact to the service to the citizens of Long Beach. In closing, I would like to remind every citizen that it is his or her responsibility to be prepared to 72 hours to take care of yourself. This is just like an earthquake scenario. Have you prepared yourself, in case there was a major disaster here in the city of Long Beach, to make sure that you and your family and your neighbors can self-sustain for 72 hours. Emergency preparedness information can be found on the city website, at your local fire station, or at any city library. We want you to be prepared, and we're here to help you. The Police Dept. has increased both water and land site patrol to 24 hours, 7 days a week, and has added additional support for land site operations to assist our officers with the protection of high profile areas. Security Division officers at the Port of Long Beach have been updated with the latest information on Port security levels and have been directed to pay close attention to specific target hazard locations within the Port. Staffing levels have been evaluated on a daily basis and we'll bring in extra personnel as additional needs are identified. It is our goal to provide a high level of security for the Port complex with the least disruption to commercial activity. The Port Security Division has been working closely with a variety of agencies, and given that this Port complex is the third largest Port complex in the world, there's a major challenge. No one unit can do it alone, it's a matter of teamwork and the support from the Police Department, the Fire Department, Capt. John Holmes from the Coast Guard, all working together is what ensures that this Port will be safe and secure for the commerce that comes and goes through this area. We have added additional personnel. We will continue to work as a team to provide the security that this complex needs. I think I would echo the comments of Mr. Ellis and Mr. Steinke. This is the largest Port complex in the country, and I think it is also the safest Port complex in the country. I can assure you that our efforts, starting at 9-11 and continuing on today, have made it available to us to meet any challenge that presents itself, and we will do so, continuing to work with all the other agencies. We have a very active program of ship boardings. We have an active program of ship identification, and we work with all of the agencies involved, federal, state and local, to ensure that we can meet any challenge that arises. So I think in summary I would say, we're prepared for anything that happens. As [LB Police] Chief Batts has said, we've gone through the scenarios. We're prepared to deal with anything that happens in the Port, and we'll continue to work with all the agencies in the Port to ensure the safety of the Port and the people who work in the Port.